This article first appeared in the Herald-Standard. Used with permission. From his days at the Virginia Military Institute to a variety of Army assignments, the Rev. Bob Zilhaver’s military experience provided life lessons that he draws on in his work as a member of the clergy. “I know there are no atheists in foxholes,’’ he said, referring to a famous military adage. Last year Zilhaver was installed as the new superintendent for the Connellsville District of the Western Pennsylvania Conference of the United Methodist Church by Bishop Cynthia Moore-Koikoi in a ceremony at Christ United Methodist Church in Scottdale. 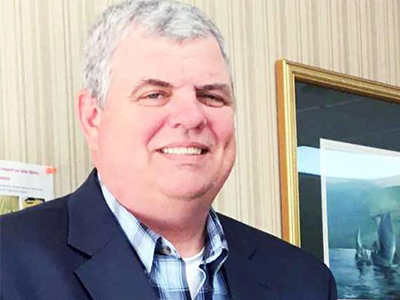 As superintendent, he serves as a liaison between the conference and 99 churches in a territory that includes all of Fayette and most of Somerset counties, as well as parts of Westmoreland and Bedford. “I don’t know what it was. I look now and ask ‘What happened?’ But I walked out and said I need to go into the ministry and let God be in charge of my life,’’ he said. Zilhaver wanted to be a chaplain but his scholarship wouldn’t allow it so he honored his commitment, going on to serve as an Army officer in field artillery. “I commanded an artillery batter in Desert Storm. We were in Kuwait with the 7th Corps, 3rd Armor Division,’’ Zilhaver said, remembering he was sent to the Middle East in 1991, receiving the call while having Thanksgiving dinner. Zilhaver spent 10 years in active duty and some time in Reserves, serving many missions before he retired as a major. He received the Bronze Star for his service during Desert Storm, the Meritorious Service Medal for Operations and Planning for Somalia; the Humanitarian Service Medal for the Hurricane Andrew Relief Effort and numerous other Army achievement medals. Throughout his military career, Zilhaver found the Church’s teachings had an influence on his life. “I know the Church helped me,’’ Zilhaver said. “I think Church teachings can have a great impact.’’ And he found a way to stay active in his religion. Zilhaver has been involved with youth ministry since graduating high school and helped start a church in Colorado in 1988 where he and his wife served as sub-district youth coordinators. Zilhaver also taught Bible studies in Desert Storm. He decided to respond to his call upon leaving the military and become a minister. He moved from New York back to Pennsylvania in 1993 and earned his MDiv from Pittsburgh Theological Seminary in 1997. Zilhaver spent 24 years in the Indiana District of the Western Pennsylvania Conference of the United Methodist Church. While in seminary, he served at Trinity, Porter, and New Salem churches in Jefferson County, and then Brookville Evangelical UMC in Jefferson County from 1997-2003. He spent 14 years at Lakeside UMC in Clearfield County until asked to serve as superintendent of the Connellsville District. In his new role, Zilhaver is a help to both the churches in his district and the bishop. The work involves travel as well as administrative skills, which he learned in the Army. Zilhaver had Army experience in personnel, intelligence, and operations. He was also a nuclear weapons specialist. “I learned about people, personnel and attention to detail,’’ he said of the Army. Zilhaver also learned that faith can help in stressful situations. Zilhaver and his wife, Amy, a reading specialist, have been married more than 30 years and have four children.